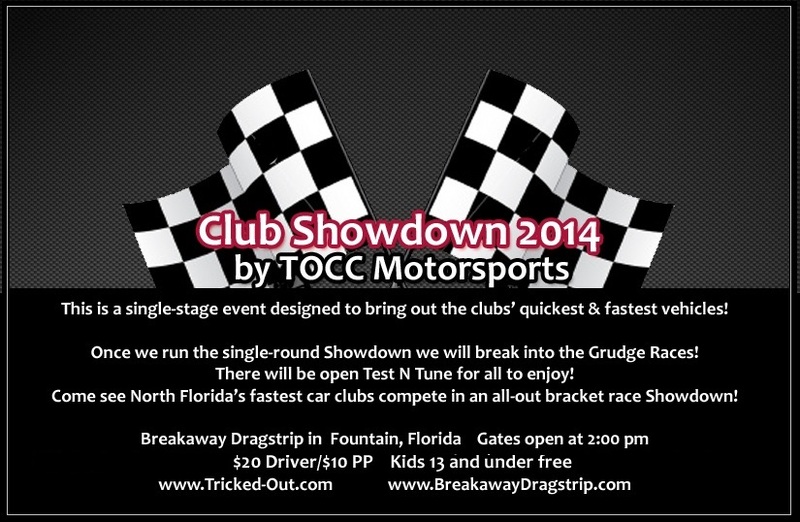 Tricked Out Car Club presents fast-fueled days of 1/8 mile drag racing enjoyment at Breakaway Dragstrip in Fountain, Florida. Join us for a fun & fast-paced event full of burnt rubber, the good ol’ smell of high octane fuel, and the synergy of lots of diverse & friendly racing enthusiasts combined! Final Stage: TBD. DATE WILL BE SET SOON. PLEASE STAY TUNED! This is single-stage event designed to bring out the clubs’ quickest & fastest vehicles. Once we run the single round "showdown," we will break into the grudge races! Meanwhile, Test N Tune will be open for all to enjoy. Note: The Awards Ceremony for the 2014 series will take place after the finish of Club Showdown & grudge races. We will present any cash/prizes, along with the annual trophy for the Car Club Challenge and the two awards for the Club Showdown. Please have your club members & officers present to enjoy this entertaining salute to the drivers and their clubs! • Clubs will be able to call out individual cars from competing clubs for a points wager. • Each club will be required to appoint a representative to make their club’s callouts. The club's official representative will be the only one allowed to make their club's callouts. • Opposing club has the right to accept or refuse callouts at their discretion without penalty. • Grudge race will be for one point from the club's previous point totals. • One point will be taken from the losing club's point total and added to the winning club's point total. • Callouts will be heads up from a sportsman tree. No negotiating for lengths, head starts, hits, etc. NOTE: Technical Issues from Tower/Equipment will require a rerun by affected racers to advance to next round. This includes dead dial-ins, misprints, non-readable tickets. etc. These will be enforced and upheld to the best of our abilities. Please notify a TOCC staff member of any concerns or issues. *RULES MAY BE ADVISED PRIOR TO RACE EVENT. If you would like to take part in this race series, or get involved with our other events, please contact us for more information. 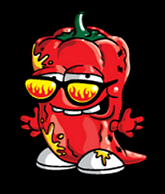 Copyright © 2007-2014 Tricked Out Car Club, New Speed, LLC. All Rights Reserved.